You may have enjoyed plenty of pasta in the past, but fusilli pasta made from einkorn is a totally different experience! Our chicken and spinach pasta bake is nutty in flavor, creamy in texture and essentially, a meal your entire family will devour. However, if you prefer to cook with all-purpose flour, try our original recipe for chicken and spinach pasta bake. The kids will hardly notice the spinach. This is because they’ll be plenty distracted by the tender chicken, gooey cheese and springy pasta! This dish is like a cross between chicken Alfredo and spinach dip, but a little healthier. Should you have leftovers (which we doubt), add a touch of milk during the reheat process—this will help to retain the moisture of the sauce. Of course, we’re partial to the enjoyment of cold leftovers to…hey, don’t judge! Preheat oven to 350 degrees then coat a 2-qt casserole dish with cooking spray. Place a large pot of water over high heat then bring to a boil. When the water comes to a boil, add a generous pinch of salt and pasta. Cook, stirring occasionally, for about 2 minutes less than the recommended cooking time on the package. Drain completely, transfer pasta to a large mixing bowl then set aside. Leave colander in the sink to drain the spinach. 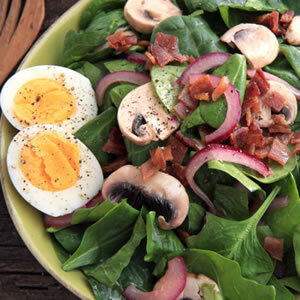 Place large skillet over medium heat, add spinach and ¼ cup of water. Cook, stirring frequently, just until the spinach is wilted and becomes dark green. Remove spinach from pan then place in the strainer. Press as much water as possible from the spinach by pressing with the back of a spoon then set aside to cool. Return skillet to heat then add olive oil. When the oil is hot, add cubed chicken then cook for 2 minutes until chicken begins to turn white. Add salt, pepper, garlic powder, onion powder, dried basil and dried oregano. Stir to combine. Cook for 3–4 minutes or until the chicken becomes light golden brown and is barely cooked through. Don’t worry if the chicken is slightly undercooked—it will finish in the oven. Transfer chicken from skillet onto a plate then set aside. Leave remaining oil in the skillet, and if necessary, add enough additional olive oil to make 2 Tbsp. Add onions and cook 3–4 minutes until softened. Add 2 Tbsp of flour to oil in the skillet then stir to dissolve. Cook for 1 minute then stir in milk to dissolve flour mixture completely. Bring milk to boil then let it bubble for 5 minutes, stirring constantly. Reduce heat to medium-low then add cream cheese. Stir until completely melted and incorporated then add Parmesan cheese, garlic powder, salt and pepper. Remove from heat then stir to combine. Stir spinach into the sauce. Once spinach is distributed through the sauce, pour sauce over the pasta in mixing bowl. Add chicken to the bowl then toss to combine. Transfer mixture to the prepared casserole dish then top with mozzarella cheese. Bake for 25–30 minutes or until the cheese is melted and golden brown and the sauce is bubbly. Enjoy! If you can, use a high-quality Parmesan cheese! It will provide an intense, savory flavor.